Trans Tank International’s expertise as an Australian industrial equipment manufacturer was on show at the 2016 Roads & Civil Works Expo. The exhibition was on at Melbourne Showgrounds from May 5 to 7. It also incorporates the International Truck, Trailer & Equipment Show and the Waste Management in Action exhibition. The star of the show for TTi wase the new low profile 13,000 and 15,000-litre polyethylene tanks, which are a game-changer when it comes to water cartage in the rural, civil works and transport sectors. Previously, the largest single-piece poly tank available had a capacity of 13,000 litres however it was substantially taller. National Marketing Manager Ross Buchner said TTi recently started manufacturing 15,000-litre polyethylene units to provide an alternative to steel tanks of similar size used by civil and local government contractors. “With polyethylene you’re able to increase the payload of tanks because it’s a lot lighter. It doesn’t rust and it’s got more give,” Mr Buchner said. While there are modular tanks available with a capacity upwards of 30,000 litres, single-piece transport tanks perform better because there are less fittings and joins, and that allows for superior reliability. Unlike fiberglass units, which can crack in the sun, TTi’s polyethylene tanks have been ultra violet-stabilised and don’t fade or go brittle. “The same can’t be said for steel,” Mr Buchner said. “Where steel tanks are heavy and more susceptible to rust and deterioration, TTi’s tanks are weighted, more flexible and designed to be impact-resistant. “This helps to mitigate potential hazards when traversing unstable and bumpy roads,” he said. TTi also brought its FloodRite water carts to the expo, along with its 13,000-litre low-profile tanks and smaller products such as tree watering units and firefighting equipment. “All of our products are designed, tested and engineer approved. We put a lot of effort into gaining those approvals and meeting Occupational Health and Safety standards,” Mr Buchner said. 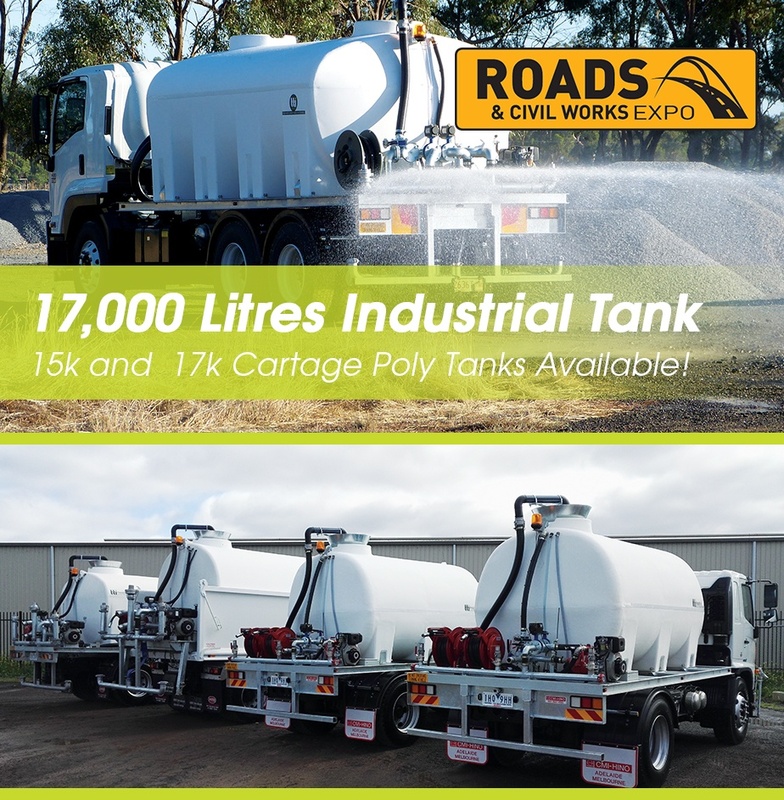 “We like to drive home the fact that we’re Australia’s safest tanks and trailers and our vision is to own that space.” The Roads & Civil Works Expo is located at Melbourne Showgrounds on Epsom Road, Ascot Vale – just 15 minutes from the CBD and 15 minutes from Melbourne Airport. Tickets on sale. Book them now. All visitors over the age of 18 must pre-register online or at the show prior to entering.